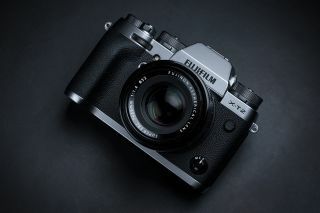 Aimed squarely at enthusiasts and professionals, this update of Fujifilm's X-T1 is a mirrorless enthusiast's camera that records 4K video as well as high-res stills – a feat that was a first for the X range, at the time of the camera's launch. Curiously though, Fujifilm chose to remove a dedicated video button from the front, suggesting that its primary market remains dedicated stills photographers. Looking and handling the part, this latest iteration is being described as a dual flagship, in that it sits alongside its manufacturer’s existing rangefinder-style camera, the S. By contrast, this latest X-series camera has been modelled on a traditional SLR, its design an evolution over its predecessor. A case in point is that the X-T2 now features a slightly larger grip and more prominent ISO and shutter speed dials. Another first for this series is the addition of a tilting LCD screen, which is an obvious boon for videographers. Naturally we also get a 2.36-million dot resolution eye-level viewfinder, which is twice as bright as its forebear’s, although the camera still sports the same weatherproofed construction we admired from the X-T1. Under the bonnet, however, we find a number of useful tweaks. Chief among these is the incorporation of the same 24.3MP APS-C sized sensor as the X-Pro2, which may disappoint some hoping for a full frame version. Interestingly, AF-C custom settings include the ability to change focus tracking sensitivity, altering how sensitive the camera is to changes in subject velocity. This is potentially vey useful for those wanting to track fast-moving subjects. For those who shoot video alongside stills, the built-in 3.5mm stereo microphone is fine to get you started, though for even better sound options, prospective purchasers might also want to investigate the battery grip which features a stereo microphone terminal. Compatible accessories include the VPB-XT2 Vertical Power Booster, which increases capture speed from 8fps to 11fps and provides enough juice for 1000 shots (if added to the performance of the battery already in the camera). This also allows for up to 30 minutes of continuous 4K video. There's also the EF-X500 hot shoe mount flash, that's also weatherproofed to match the resilience of the X-T2's body. Serious photographers looking for a compact all-rounder who haven’t already adopted Sony’s rival A7 system as a best-of-all-worlds solution should find this Fujifilm an enticingly safe pair of hands. We praised the previous X-T1 as an approachable and portable high-end mirrorless camera, and the X-T2 ups the performance ante a stage further.